Can Pop-Ups Pave the Way to Thriving Public Space in World's Cities? FILE - Women sit in a new pop-up space in Kuala Lumpur's old city, Malaysia, Feb. 13, 2018. On a patch of gravel that was once a nondescript bus stop in Kuala Lumpur's old city, passersby can now find brightly-painted wooden pallets that double as seating and shelves stocked with free books for the taking. At least, for the time being. The transformation is temporary, a monthlong demonstration to judge the public's reaction to the idea of turning a slice of the sprawling Malaysian capital no bigger than a small hotel room into a permanent public space. This try-it-before-you-buy-it approach is known as a pop-up. Pop-ups have become popular in many cities, often the brainchild of local residents in an effort to improve their neighborhoods or turn derelict spaces into community hubs. They include cycling activists who paint bike lanes without government approval to push for safer streets, retailers who launch temporary shops in repurposed shipping containers to revitalize flagging high streets or food trucks gathered in empty parking lots. "We've found by working with cities sometimes they are a little bit wary about having to put a lot of investment into public spaces," said Cecilia Anderson, who leads the public space program at UN-Habitat, the U.N.'s lead agency on urban issues. "Sometimes it helps to do a small pop-up public space just to showcase on a temporary level what kinds of benefits it has for the city, the citizens, and that neighborhood." Public space has been shrinking in the world's fast-growing cities, where almost 70 percent of the population is expected to live by 2050, compared to just over half today, according to U.N. estimates. Experts say, however, it should be a paramount goal for city leaders as research shows inadequate, poorly designed or privatized public spaces generate exclusion and marginalization. "Public space is really the backbone or the skeleton of the city," Anderson told Reuters. Highlighting its importance for social inclusion and well-being, public space was included as a target in the U.N. Sustainable Development Goals, with the aim to provide universal access to "safe, inclusive and accessible, green and public spaces" by 2030. In Kuala Lumpur's bustling historic center, local urban regeneration agency Think City installed a pop-up plaza along Petaling Street and three small green spaces, known as parklets. FILE - A group of people enjoy a new pop-up space in Kuala Lumpur's old city, Malaysia, February 2018. They form a cluster of benches, plants, and overhead canvas for shade taking up the size of a parking spot along the busy street, as well as a mock microhousing unit in an existing park. It also spruced up a laneway next to the agency's headquarters with a mural and a chalkboard inviting ideas on how else to improve the neglected alley. For Think City director Neil Khor, the pop-ups are an attempt to reignite flagging interest in public space among residents in the city of 6.5 million people. "This is the ultimate irony — when I was growing up, we had more public space," said Khor, whose organization works on community-based urban regeneration. "Some time in the 1980s, we had this mall culture from the United States. Suddenly the public space is exactly inside the mall." While Kuala Lumpur's extravagant malls never seem to lack for visitors, the pop-ups garnered mixed reviews, if they were noticed at all. 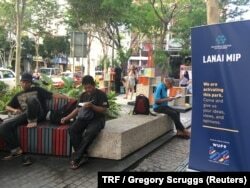 On two recent visits to the temporary public spaces, some of the parklets were empty, though one equipped with mobile phone chargers proved popular with a quartet of teenagers. A parklet adorned with a chessboard sat vacant while next door, Bangladeshi migrants conducted a vibrant trade in fruits and vegetables on the sidewalk, their produce truck blocking a freshly painted bike lane. The plaza bedecked with bookshelves drew several curious onlookers, who were invited to leave comments on what they would like to see in the space, and whether it should be made permanent. Visitors asked for more seating, a drinking fountain, shade and a playground for children. Most respondents declared their enthusiasm for a permanent plaza. "It's wonderful, it looks good, it makes the place beautiful and lively. No complaints," said paralegal John Ng, who stopped by after work. "There should be more public spaces instead of tall buildings and cars," he said, standing in the middle of the plaza. Retiree Emily Tan, taking a break from a shopping trip in Chinatown, preferred to sit on permanent benches next to the pop-up and take in the view. "This one they should develop as a park," she said. "More plants, flowers, and let people sit down." While officially-sanctioned pop-up public spaces can be found in cities around the world, the trend started in the developed world. A San Francisco design firm invented the parklet, and New York City became a model for carving out small plazas from unused odds and ends on the city's streets. "These temporary approaches in the global north were meant to bring informality to cities that didn't have them," said Ethan Kent from New York-based non-profit Project for Public Spaces. "These were solutions meant to bring back that life to the streets." But as the concept and the designs that go with them have become universal, critics question whether pop-ups can work just everywhere. "On the one hand, it looks like a free street library, where you're encouraged to take a book you like," said Emily Silverman, a professor at Hebrew University in Jerusalem. "But the black base, cheerful colors, and especially the position in the middle of a street during an international conference, signal 'don't touch,'" said Silverman, referring to the World Urban Forum in Kuala Lumpur last month. She said in Jerusalem, free street libraries worked well in secular and middle-class professional areas, but they got vandalized in ultra-Orthodox areas, for fear they would help distribute otherwise forbidden books. "The [pop-up's] lure of 'lighter, quicker, cheaper' can encourage artificial importing, ignoring local context to just get stuff done," she said. Khor defended the overall initiative in Kuala Lumpur as a valuable social experiment. He noted an impromptu badminton game in the alleyway, chess matches between migrants in the parklet, a tea shop that regularly waters the plants in the parklet, and crowds eager to explore a micro-housing prototype. "I'm not saying these projects are perfect," he said. "We wanted to show that urban regeneration is a process."